Military Deli & Bakery Services, Inc. is a government contractor in military commissaries under the Defense Commissary Agency (DeCA). Both civilian and military dependent candidates are encouraged to apply. You don't have to be a military dependent to work in a commissary. Please see our list of MDBS Sites. We have many exciting job opportunities available to smiling and personable candidates who provide excellent customer service and want a good career in a successful company. Job positions may require some weekend work. 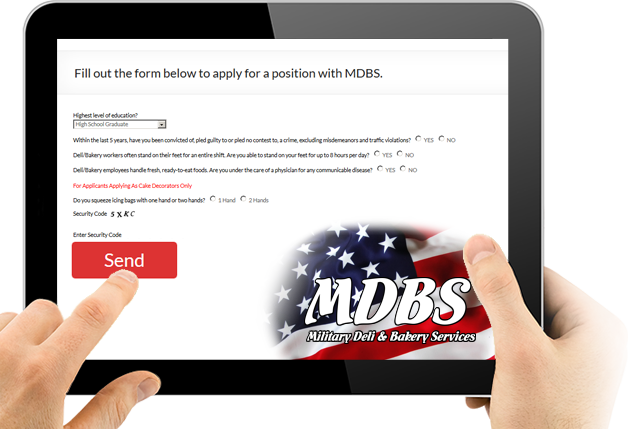 To apply for a position, please e-mail your resume to human.resources@militarydeli.com. You may also apply in person at the Deli/Bakery Counter – please call ahead to the Deli/Bakery regarding any security requirements for entrance to the base. If you do not have a resume, you may complete our online application. If an applicable position is available, we will contact you for more information. To begin the employment process fill out our Employment Application Form.